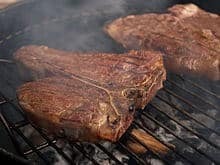 A compound abundant in red meat and added as a supplement to popular energy drinks has been found to promote atherosclerosis – or the hardening or clogging of the arteries – according to Cleveland Clinic research published online this week in the journal Nature Medicine. The study shows that bacteria living in the human digestive tract metabolize the compound carnitine, turning it into trimethylamine-N-oxide (TMAO), a metabolite the researchers previously linked in a 2011 study to the promotion of atherosclerosis in humans. Further, the research finds that a diet high in carnitine promotes the growth of the bacteria that metabolize carnitine, compounding the problem by producing even more of the artery-clogging TMAO. The research team was led by Stanley Hazen, M.D., Ph.D., Vice Chair of Translational Research for the Lerner Research Institute and section head of Preventive Cardiology & Rehabilitation in the Miller Family Heart and Vascular Institute at Cleveland Clinic, and Robert Koeth, a medical student at the Cleveland Clinic Lerner College of Medicine of Case Western Reserve University. The study tested the carnitine and TMAO levels of omnivores, vegans and vegetarians, and examined the clinical data of 2,595 patients undergoing elective cardiac evaluations. They also examined the cardiac effects of a carnitine-enhanced diet in normal mice compared to mice with suppressed levels of gut microbes, and discovered that TMAO alters cholesterol metabolism at multiple levels, explaining how it enhances atherosclerosis. The researchers found that increased carnitine levels in patients predicted increased risks for cardiovascular disease and major cardiac events like heart attack, stroke and death, but only in subjects with concurrently high TMAO levels. Additionally, they found specific gut microbe types in subjects associated with both plasma TMAO levels and dietary patterns, and that baseline TMAO levels were significantly lower among vegans and vegetarians than omnivores. Remarkably, vegans and vegetarians, even after consuming a large amount of carnitine, did not produce significant levels of the microbe product TMAO, whereas omnivores consuming the same amount of carnitine did. Prior research has shown that a diet with frequent red meat consumption is associated with increased cardiovascular disease risk, but that the cholesterol and saturated fat content in red meat does not appear to be enough to explain the increased cardiovascular risks. This discrepancy has been attributed to genetic differences, a high salt diet that is often associated with red meat consumption, and even possibly the cooking process, among other explanations. But Hazen says this new research suggests a new connection between red meat and cardiovascular disease. While carnitine is naturally occurring in red meats, including beef, venison, lamb, mutton, duck, and pork, it’s also a dietary supplement available in pill form and a common ingredient in energy drinks. With this new research in mind, Hazen cautions that more research needs to be done to examine the safety of chronic carnitine supplementation. This study is the latest in a line of research by Hazen and his colleagues exploring how gut microbes can contribute to atherosclerosis, uncovering new and unexpected pathways involved in heart disease. In a 2011 Nature study, they first discovered that people are not predisposed to cardiovascular disease solely because of their genetic make-up, but also based on how the micro-organisms in their digestive tracts metabolize lecithin, a compound with a structure similar to carnitine. Is it conceivable that the use of probiotics could alter the effect of TMAO?